With skyscrapers being built taller, and elevators moving faster, the air in elevator shafts acts like a compression spring to resist the motion of the elevator, and adds to the load on the cables, and more electricity to power the motor. The elevator in the 108-story Shanghai Tower, being built in China, will reach a speed of 59 ft./sec. (over 40 MPH). elevator, in the shaft, in the opposite direction of the elevator. This is particularly a problem when the car travels the full length of the shaft, where there is a maximum amount of air compression. 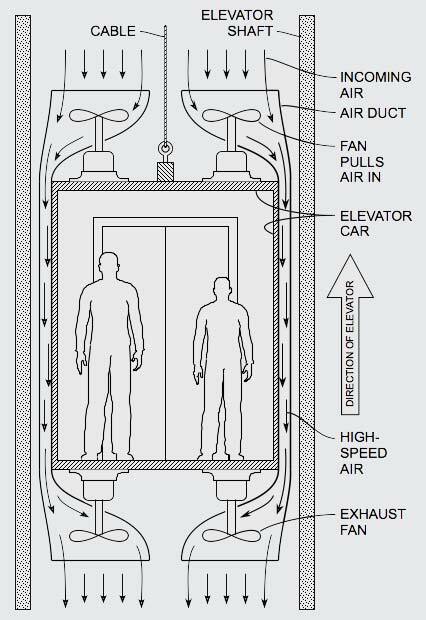 This is a proposal to reduce the effect of this elevator “air spring” by using fans to pull the air in the forward direction, pass it through reduced-cross-section air ducts beside the car, and expel it out on the trailing end, to make the elevator aerodynamically neutral. The fans are speed proportional to the elevator, and run in the reverse direction when the elevator changes direction. The idea is similar to the vehicle air – drag reduction technique on p. 27 in this notebook, and is also similar to the way subway tunnel – boring machines, and earthworms, eat their way forward to create a tunnel.